To fall asleep and stay asleep, you need to be able to unwind, chill out, and let go. This is easier said than done in today’s fast-paced, frantic world. Focusing on being able to relax can do amazing things for your sleep patterns and quality of life. Stress management isn't the only solution to insomnia and poor sleep, but it's a great starting place because your quality of life will improve. Relaxation Aids: Start by treating yourself to some of the wonderful stress management aids out there. Caffeine-free herbal teas, aromatherapy, massage, gentle music, and warm baths all can help you unwind and take time for self-care. 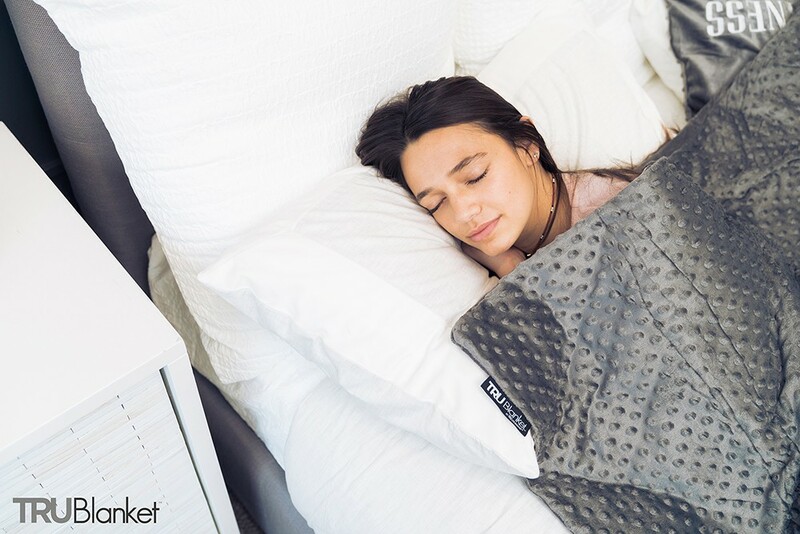 We love the TRUBlanket weighted blanket, of course - it's a heavy blanket that makes you feel like you're getting a full body hug and helps your body to fully relax. Mindfulness: Think meditation, yoga, and other practices meant to help you slow down and experience life as it is right now. Stress often comes from living in the past or worrying about the future. While there are things we can do to change what will happen, staying awake at night pondering isn't really productive. But turning off that problem-solving brain can be very hard. Meditation can help you learn to quiet the chatter and accept what is right now so you can rest and restore to handle tomorrow's worries. Limit Late Night Screen Time: There are a number of ways that watching television, playing games on your phone, or reading articles on your computer can interfere with sleep. A big one is blue light, that naturally affects your melatonin cycle. Keeping in theme with stress reduction, think how the overload of information adds to your mental load, instead of helping relieve it. Creating a calming ritual at night time without screens is a great way to set yourself up for sleep success. Exercise is an excellent step to getting better sleep. World Health Organization guidelines state that 150 minutes of moderate intensity activity a week is a minimum for healthy bodies, or 75 minutes of vigorous activity. That's just the minimum, though - for additional health benefits you should double that! That's 22-45 minutes a day. Exercise helps you stress less and digest your food better. Moving your body helps to strengthen it which reduces aches and pains. Try a 30-minute walk every day and see how your sleep and well-being improve! Taking care of yourself will pay off big dividends. You'll be happier, healthier, and sleep better. Try applying some of these strategies, and see what happens!